Setting aside his greatest asset --- his bomb-rocking, gut-socking ax --- Tom Morello quietly picks up an acoustic guitar. For this is to be an old-fashioned protest. And while it will be old-fashioned, do not misconstrue "old-fashioned" to mean "wimpy" or "hippie." With his voice, those taut strings and a small posse of other instruments (even if it is producer Brendan O'Brien who plays them), Morello wields plenty of power. Whether he knows what to do with it is another thing. 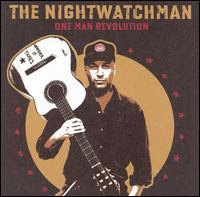 One Man Revolution, the Rage Against the Machine veteran's first solo album, under the alias the Nightwatchman, teeters on a mound of quality lines and clunkers, of heart and half-wittedness. At times, Morello approaches profundity. In the title track, he declares, "In my nightmares, the streets are flame / and in my dreams, it's much the same." He offers a similarly deep phrase in "Maximum Firepower": "The skin you're in / makes choices for you." Highlight "Let Freedom Ring" celebrates freedom with the kind of passion not native to people born into it. With a chiming piano and Morello's solemn sincerity, the song hits all the right notes. His voice boasts a compelling confidence, the kind that comes when you know you're right. This adds to the song's dignified and respectful air, and Morello never strays into overly sentimental territory. If only he had an album's worth of those songs in him. More often than not, the discipline seems loose and the material amateurish. An excessive repetition of lines and a reliance on devices contribute to One Man Revolution's rudimentary feel. While it's true that many classic protest songs use repetition as a way to 1) Make a song easier to remember, and 2) Drive home a point, no one would mistake Morello's lyrics for Bob Dylan's, even though "The Dark Clouds Above" adopts the structure (and use of meteorological metaphor) of "Blowin' in the Wind." Throughout the album, Morello clings to another device: numbers. Though used to good effect on the solidarity pledge "Until the End," which counts down from 10 to one, the presence elsewhere of the same technique, albeit in abbreviated form, diminishes its power. On "Flesh Shapes the Day," Morello includes the lines "ten letters I am writing" and "nine circles I am drawing." That's in addition to the album's "seven summits" and "seven seas" and "forty days in the wilderness" and "forty sleepless nights" and "one man revolution" and "two steps toward you" and "twelve fine friends" and "three more seconds" and a patridge in that tree with the yellow ribbon (maybe). These grievances alone could not quite derail the album, particularly with the strong work in "Let Freedom Ring" and "No One Left," a requiem for fallen soldiers. But "Flesh Shapes the Day" proves up to the task. What begins as merely a substandard, generalized diatribe turns laughable about a minute in, when Morello starts hooting, growls "mic check," then follows with another round of hooting. Ruling out momentary insanity, this happens again later on. It's the chorus. Such decisions endanger the credibility of One Man Revolution, making it border on campfire sing-along rather than well-conceived studio recording. Which is unfortunate, because the album deserves to be heard --- if only to prove the man can hold a tune. Morello's vocals, scratchy and radio-friendly, fall somewhere between those of Jakob Dylan and Everlast. If there's anybody who can relate to Morello's situation, it's Everlast. When House of Pain, the sole source of his success, disbanded in 1996, he found his way to an acoustic guitar. The resulting album, Whitey Ford Sings the Blues, was a smash. It launched Everlast to heights he and House of Pain had never known. Suddenly he was recording a duet with Carlos Santana, then picking up a Grammy (whatever that's worth these days) for that collaboration. But the chain of events was due in large part to the crossover appeal of Whitey Ford Sings the Blues. One Man Revolution doesn't span a lot of genres, so the chance of it following such a path seems beyond remote. If Carlos Santana likes it enough, though, maybe there's hope --- of a guitar duel. That would be pretty cool.